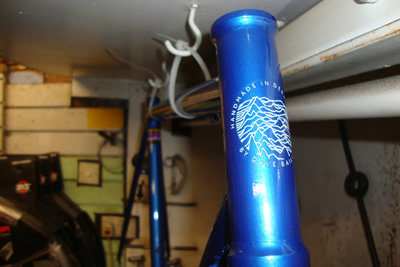 We have been building frames, repairing and renovating bikes, frames and wheels for over 30 years. We fix all types of bikes: mountain, touring, racing, time trial, bmx, tandem and electric assisted. We service, repair and renovate aluminium, steel and titanium frames. We also sell parts, frames and complete bikes. As we have low overheads we can pass these on to you and we are often as cheap as the best internet prices. Reynolds 725 frame, size 55cm, steel or carbon fork (can be supplied painted to match). Contact us if you're interested. Have a look at our frame building gallery - we do a range of tubing and you can specify exactly what you want on the bike, from finishing kit to colour. We offer a quick, friendly and personal service. Our staff are highly knowledgeable and skilled. Dave is a CYTECH accredited mechanic with over 30 years experience of both repairing and riding bikes (racing, mountain bike, touring and tandem). He is also a qualified cycle trainer and is passionate about cycling as a mode of transport. Ed is a CYTECH accredited mechanic and has come to us from Recycle Bikes. He is a keen mountain biker and cycle tourist, and self-confessed bike geek. Just the person to talk to about suspension forks and disc brakes. 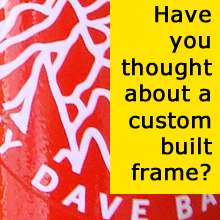 He is also very interested in frame design and is learning the art of framebuilding. He has previously worked as a Bikeability Cycle trainer, mechanics tutor, mountain bike guide and bmx coach. Vernon is a qualified metallurgical engineer and can give a level of advice not available from other frame builders. He has over 30 years experience of manufacturing and renovating solos and tandems.